Unfortunately, Christ was not always loving. He was not always nice. He was not a pacifist. If he had, the Sanhedrin would not have had such a compelling desire to see him crucified. In the eyes of the Romans and the Jewish ruling class, Christ was a heretic, a blasphemer, and a disturber of the peace. 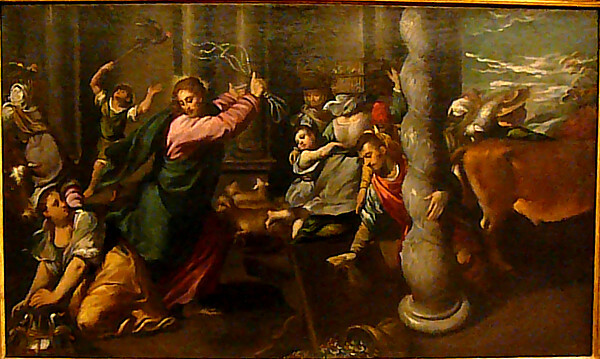 The classic example is the display of anger by Christ at the desecration of the temple. He was so angered that he made a whip and then went on a rampage, overturning tables and expelling the moneychangers and animal vendors. I am sure there were at least a few on the receiving end of that whip. He called those who were violating the sacred nature of the temple thieves. Clearly not peaceful and loving. The actions of the Scribes and Pharisees so upset Christ that he called them hypocrites a number of times. He listed their faults, which included laying heavy burdens on their servants, being fake, lying, and perjuring. He spoke plainly in telling them the way they outwardly acted pious but inwardly possessed a cancerous rot of spirituality. Clearly not nice. In seeking to live a Christ-like life, there are times to stand against the foolishness of the world and to state the truth of Christ’s teachings. Righteous anger is a reasonable reaction to things that obviously defy God’s law. There are times when speaking the truth will result in hurt feelings. There will be a time when one must climb off the fence and take a side either for or against God’s teachings. When it came to doctrine, Christ never agreed to disagree. A call to Christianity and/or to be more Christ-like is sometimes nothing more than a tool used to silence an opposing point of view. Those who seek to use their foe’s own Christianity against them use this tool freely. Sadly, too many allow this tactic to succeed rather than remembering who Christ truly was: A defender of the faith, a man who fought literally to the death to spread his message. This is why merely taking upon oneself the name of Christ is insufficient. One must always remember him also if they are to have his Spirit. Only then can one act as Christ would.